While I was browsing Amazon.com for Christmas gifts this year… I came across something I just HAD to have! 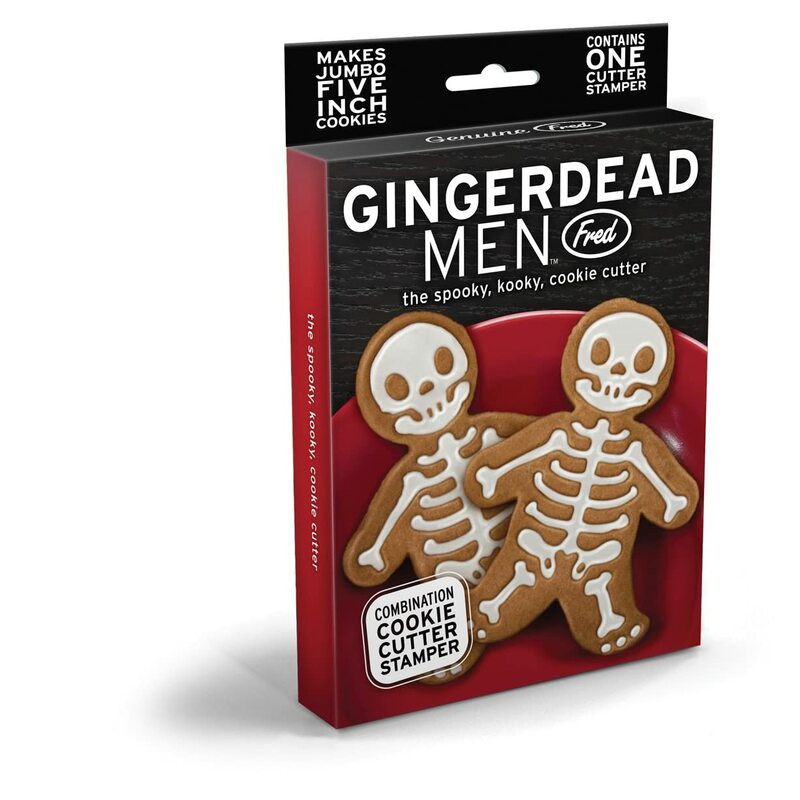 The “GingerDead Men” Cookie Cutter & Stamper combination, by Fred. 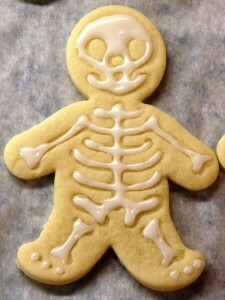 I figured this would make an interesting departure from the regular (boring) sugar cookies that I make with star or tree cookie cutters. The cookie cutter/stamper comes all in one piece… it’s a white plastic gingerbread man shaped cookie cutter – flip it over for the skeleton stamp. My favorite ginger cookie recipe has already been posted… and I much prefer those over any other “gingerbread” cookie dough. The problem is, that soft ginger cookie recipe is not meant for use with cookie cutters. Plus, I like to have a variety of different flavored cookies to give away at Christmas (so I don’t want to make another ginger flavored cookie). 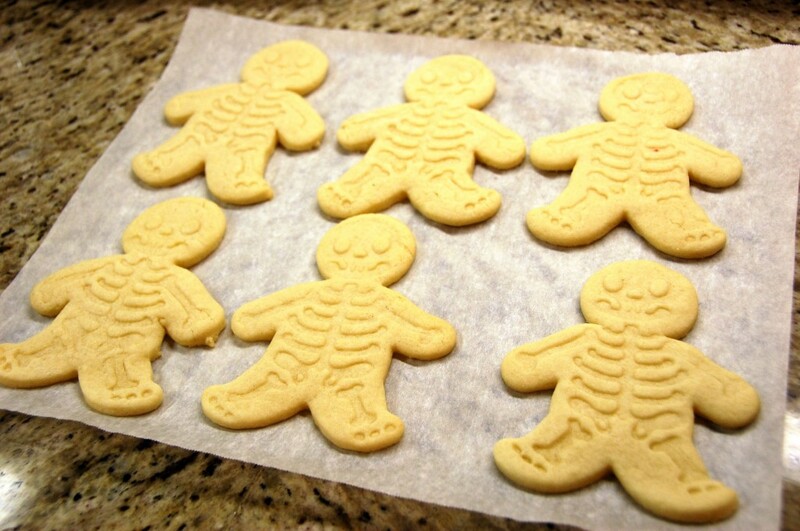 This year I’m making: soft ginger cookies, sugar crusted shortbread cookies, pecan snowballs, chocolate glaciers, lemon ricotta cookies, and these “GingerDead” men sugar cookies. 1. In a large bowl, cream the butter, salt, sugar, and vanilla. Mix in the eggs, then mix in the flour and baking powder. Chill the dough for 1 hour. When ready, flour the counter, and roll out the dough 1/4 inch thick. 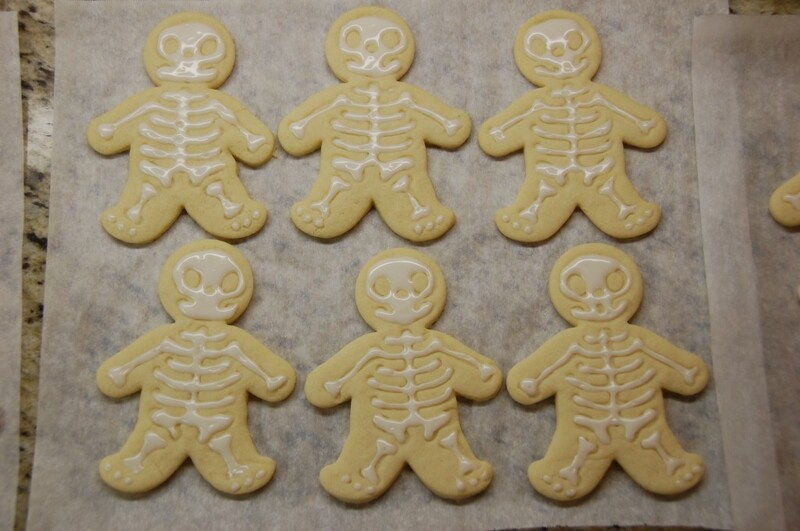 Gently press the cookie stamp into the dough, then use the cookie cutter to cut the shape out. Transfer the designs to a parchment paper lined cookie sheet (about 6 cookies per sheet). You can re-roll the scraps – just go easy on the flour. Bake at 400 degrees for 6-7 minutes (one cookie sheet at a time). 2. Remove the cookies from the oven, allow to cool on the pan for 5 minutes, then remove to a rack or parchment paper to cool. Decorate once the cookies are completely cool to the touch. 3. 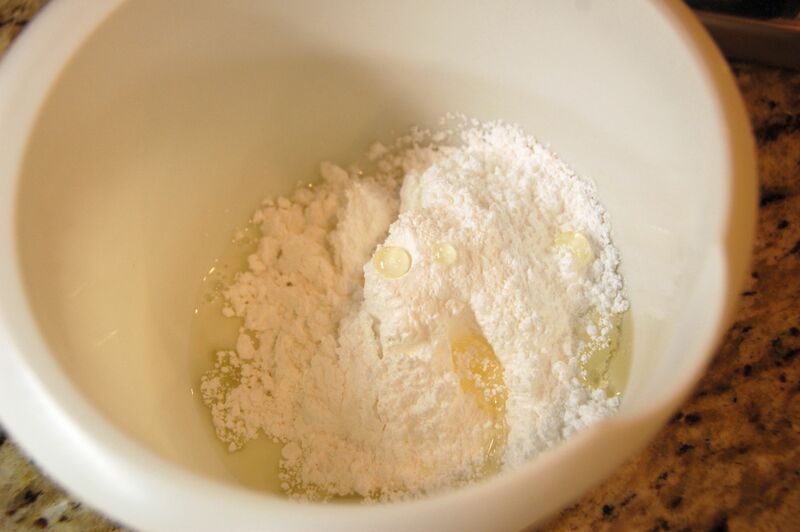 Make the icing by mixing all of the ingredients in a small bowl with a whisk. If the icing clumps into a large ball, add milk 1 tsp. at a time to thin out. You want the icing consistency to be thin enough to pipe… but not so thin that it will run all over the cookie instead of holding together. 4. 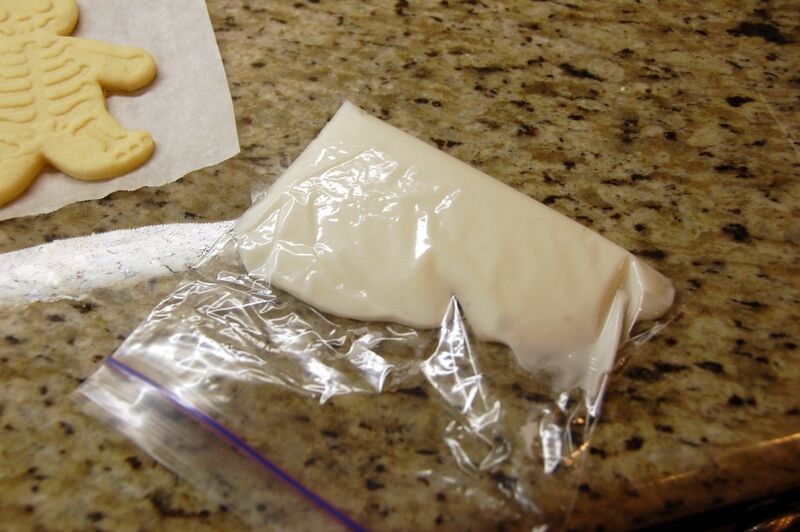 Scrape the icing into a ziploc bag, and cut a small corner off the bag. (This is my “Easy” piping bag method when I don’t want to mess with a pastry bag + tips). 5. Use the stamped design as a template to pipe your icing on the cooled cookie. 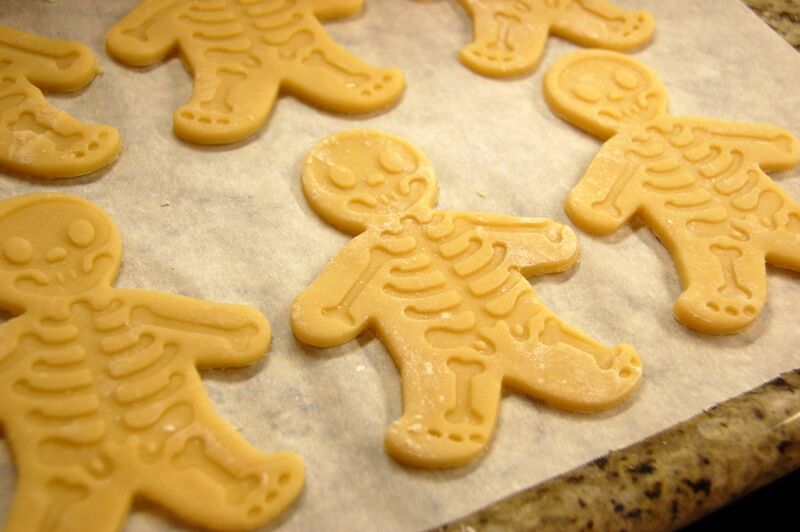 Allow the frosting to set overnight, or about 12 hours before stacking the cookies in an airtight container. I am having difficulties getting good results. Did you stamp or cut first? I stamped first, then carefully lined up the cutter and pressed down. Then, use a really flat metal spatula to carefully slide under the cookie and transfer to a baking sheet.